Experience you can rely on. Advice you can trust. The law firm of Normandin, Cheney & O'Neil, PLLC, has been committed to achieving outstanding results for individuals and businesses in New Hampshire since 1914. With an established presence in the community and a hard-earned reputation for excellence and integrity, we provide trusted guidance and creative solutions to legal obstacles. From our Laconia office, we can assist New Hampshire residents who need an injury lawyer or representation in a wide range of other matters, including corporate law, real estate transactions, land use, workers’ compensation, Social Security benefits, family law, estate planning and probate, financial exploitation and abuse of elders, and criminal defense. Our clients come from throughout New Hampshire, including Belknap, Grafton, Carroll, and Merrimack Counties. The New Hampshire personal injury lawyers at Normandin, Cheney & O'Neil can provide vigorous advocacy for victims of car accidents, slip and falls, wrongful deaths, and other harmful events. Personal injury cases are brought to seek damages for the physical and emotional harm caused by the careless or wrongful conduct of another person or entity. Forms of compensation may include past and future medical expenses, lost income and earning capacity, property damage, pain and suffering, and loss of consortium, among other examples. These claims generally must be filed within three years of an accident. Most personal injury cases are based on the legal theory of negligence, which is a failure to use the appropriate level of care to avoid posing unreasonable risks of harm to others. To establish negligence, a plaintiff must prove that the defendant owed a duty of care to the victim, the defendant breached that duty of care, the defendant’s breach caused an injury to the victim, and quantifiable damages resulted. In a car accident case, for example, a driver may be found negligent if he or violated a traffic law or texted while driving. Similarly, businesses and other property owners may be found negligent if they fail to maintain their premises in a reasonably safe condition and repair or warn of dangerous conditions. Our Commercial and Corporate Practice Group attorneys act as general counsel to more than 200 businesses in New Hampshire. We have substantial experience forming corporations, limited liability companies, and other business entities, as well as handling litigation and contract transactions. Our corporate lawyers can assist in business planning and succession, financial transactions, contract disputes, commercial lease agreements, environmental issues, and other matters. Real estate and land use laws govern an expansive range of transactions, regulations, and property-related matters. As one of the largest title bases in the region, Normandin, Cheney & O'Neil can assist people who are seeking to cure real estate title defects. We can also provide guidance in foreclosures, title insurance, subdivision and condominium creation, shorefront development, and many other real estate projects. Our transactions attorneys offer a comprehensive approach, at times collaborating with our litigation attorneys in order to provide solutions that meet the needs of the people and businesses that we serve. Workers’ compensation benefits are paid when you are injured on the job. Social Security Disability benefits are available if you become disabled due to illness or injury and your disability has lasted, or is likely to last, for twelve months or more. Under the workers’ compensation system, employers are required to provide certain benefits to workers who have been injured in the course of their employment. In some cases, employers or their insurers may dispute a claimant’s eligibility and refuse coverage, which may result in a lengthy appeals process. Social Security benefits are based on proof of a specific disability that prevents a claimant from working, although the disability does not need to arise from a work-related injury. 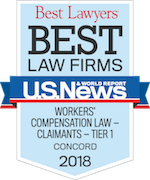 The lawyers at Normandin, Cheney & O'Neil can assist New Hampshire residents in applying for workers’ compensation and Social Security benefits, and we can also represent them during any appeals if needed. Ensuring the financial wellbeing of your loved ones and the appropriate settlement of your affairs after your death can be achieved through careful estate planning. At Normandin, Cheney & O'Neil, our Estate Planning and Probate Practice Group provides a full range of legal services, including assistance with probate and trust administration, wills and trust formation, prenuptial agreements, business succession planning, Medicaid planning, and estate tax issues. Divorce, parental rights and responsibilties and support, and other domestic disputes are sensitive issues that may require capable legal guidance. The dedicated attorneys at Normandin, Cheney & O'Neil handle a variety of issues that arise before, during, and after marriage, as well as matters involving parental rights and responsibilities, paternity, and support. If you need to modify a custody or support arrangement, for example, you will need to show that a substantial change in circumstances has occurred. Having an experienced attorney can be critical in helping you meet this standard, or in advocating that a certain parenting arrangement promotes the best interests of your child. At Normandin, Cheney & O'Neil, we understand that every criminal case is serious and potentially life-changing. However, the prosecution must prove each element of its case beyond a reasonable doubt, and there are many constitutional rights that protect defendants. We can develop a defense strategy based on the specific facts of your case. This may involve challenging the prosecution’s ability to prove one or more elements of the charged offense, such as whether you had the required intent to commit the crime, or arguing that law enforcement acted unconstitutionally in obtaining the evidence against you. At Normandin, Cheney & O'Neil, we are dedicated to furthering the interests of individuals and businesses through exceptional service and dependable representation. Having served New Hampshire residents for over 100 years, we are thoroughly experienced in matters that require a criminal defense attorney and in civil matters such as accident claims, business formation and disputes, land use and real estate transactions, divorce, estate planning and probate administration, financial exploitation and abuse of elders, and disability benefits. Our New Hampshire personal injury attorneys maintain an office in Laconia, from which we can assist clients in Belknap, Grafton, Carroll, and Merrimack Counties, among other areas of the state. To discuss your legal matter with an experienced attorney, contact Normandin, Cheney & O'Neil by phone at (603) 524-4380 or through our online form for a consultation. We serve clients throughout New Hampshire including those in the following localities: Belknap County including Laconia; Carroll County including Ossipee; Cheshire County including Keene; Coos County including Lancaster; Grafton County including North Haverhill; Hillsborough County including Amherst, Bedford, Goffstown, Hudson, Manchester, and Nashua; Merrimack County including Concord, Hooksett, and Suncook; Rockingham County including Derry, Exeter, Hampton, Londonderry, Portsmouth, Salem, and Windham; and Strafford County including Dover and Rochester.